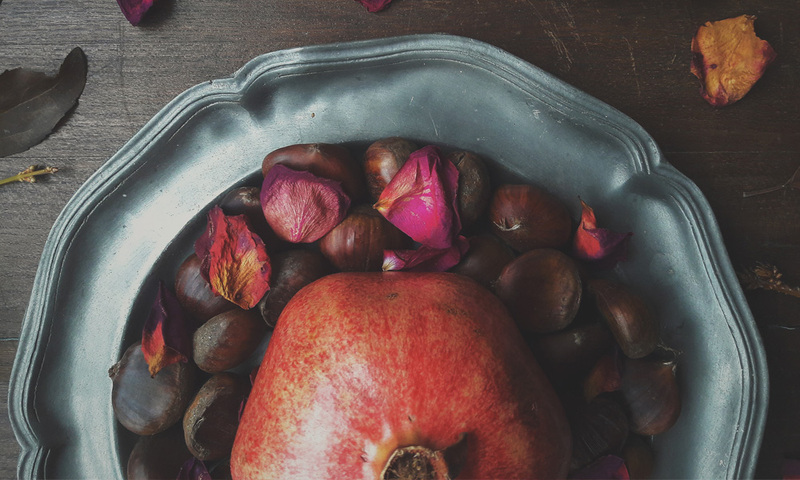 From ancient times to the modern era, pomegranates have been the gem of the fruit world. Within the thick and inedible outer skin, there is a beautiful cluster of jewel-like arils. The sweet and tart juice that surrounds each edible seed is rich in nutrients and full of flavor, making them an excellent addition to a healthy diet. Extremely high in antioxidants, the health-promoting potential of pomegranates exceeds other sources. In this article, I’ll explain why pomegranates are so darn good for you and outline all the miraculous benefits for your body. I’ll also share a few of my favorite pomegranate recipes in part 2 of this article, and best of all, I’ll show you how to peel one without making a juicy mess. Pomegranates really pack a punch. The pure juice of a pomegranate is dense with nutrients and has an antioxidant activity three times higher than red wine or green tea2. Each ½ cup serving of arils or pure juice can provide a significant amount of your daily vitamin C, E and K, potassium, and folate. The seeds, if you choose to eat them, are a great source of dietary fiber and healthy fats1. If I haven’t convinced you yet, let’s get more specific. Pomegranates are one of the best sources of polyphenols. These naturally occurring compounds have antioxidant properties that prevent cell damage, fight infection, and combat an abundance of health problems4. All those polyphenols make pomegranates one of the best sources of antioxidants out there, ranking significantly higher than blueberries and other antioxidant-filled fruits3. Let’s look at 10 of the biggest benefits pomegranates can have on your health. Pomegranates are rich in dietary nitrates, which improve blood flow. Drinking pomegranate juice before a workout can improve your endurance and efficiency5. Clinical trials have also shown that it increases performance during weight training sessions, speeds up recovery and reduces muscle soreness after6. Pomegranates can improve your performance other places as well, like the bedroom. That increased blood flow isn’t limited to only your muscles… if you catch my drift. In addition, antioxidant therapy with strong sources like pomegranates, have shown promising results in preventing the smooth muscle dysfunction and fibrosis that leads to erectile dysfunction7. Pomegranates have the power to boost your metabolism and improve body composition. A large number of polyphenols in pomegranate juice can lower your bodies initial glycemic response to a carb dense meal and continues to help regulate blood sugar through the later stages of digestion8. Studies have also found that regularly consuming pomegranate juice increases the binding of high-density lipoproteins to the enzyme paraoxonase, improving fat metabolism and preventing weight gain9. Even the seeds are rich in linolenic acid and punic acid. Both of these fatty acids have a positive effect on fat metabolism and work to prevent insulin resistance and obesity10,11. Simply explained, aging is the accumulation of damage to cells and tissues. It is believed that oxidative stress from free radicals is the leading cause of this damage. With advancing age and decades of accumulated damage, our risk of disease and death builds. It has been found that diets rich in antioxidants, like those found in pomegranates, have proven anti-aging benefits and are effective in reducing the oxidative stress that leads to signs of old age4. These signs sign also appear on the outside, so yes, you will look younger as well! Enjoying pomegranates on a regular basis can improve your cholesterol levels9. Studies also suggest that pomegranate extracts may reduce blood pressure and could possibly prevent hypertension in the normotensive population12. Antioxidants protect neurons in the brain. Various studies show clear benefits on memory and other cognitive functions. Task-related increases in functional brain activity, better memory of daily tasks13, improved memory after physical truamas1415 have all been reported. Best yet, pomegranate inhibits the inflammation and amyloidogenesis that leads to Alzheimer’s disease16. Pomegranate fruit, its juice, extract, and oil are all incredibly beneficial for your health. The anti-inflammatory and antioxidant properties improve immune function, so you are better suited to fight infections17. There is constantly building evidence that as antioxidants, polyphenols protect the different components that make up each of the cells in every type of tissue; and therefore, limit the risk for many degenerative diseases4. Studies have shown promising results in treatment and prevention of cancer, cardiovascular disease, diabetes, dental conditions, erectile dysfunction, bacterial and fungal infections, antibiotic resistance, skin damage, bone loss, male infertility, Alzheimer’s disease, arthritis, and obesity18. So how do you get all that pomegranate goodness into your body? That’s up to you. Drink the juice, eat the seeds, buy some extract, or incorporate some pomegranate into your favorite recipes. Click here to see 3 of my personal favorite pomegranate recipes and learn the absolute BEST way to get all those delicious arils out of that stubborn skin. 1. Basic Report: 09286, Pomegranates, raw. United States Department of Agriculture, Agricultural Research Service.